Home owners can add significant value to their property by undertaking a basement bathroom installation project. This particular home improvement project has been a recent trend with homeowners seeking to transform their basements into more usable living spaces such as game rooms, play rooms, offices, home theaters or guest bedroom space. A basement bathroom installation can certainly add to the comfort of any living space, as visitors do not have to venture upstairs during moments of need. The most important tip for homeowners considering a basement bathroom installation is how to defy gravity, and pump waste water up from the basement and into a sewer line or septic system. It is imperative that you prevent backflow problems. Luckily, there are several options for accomplishing this task. The three most common options include: macerating systems, sump pump ejector systems or upflush toilets. A macerating system that can effectively handle waste water from the sink, shower and toilet, won�t require you to dig up your basement floor. Macerating systems use a rotating cutting blade to liquefy human waste and toilet paper. When mixed with flushing water the waste is pumped into a sanitary sewer as a fine slurry. Macerating systems are considered to be environmentally sound because they typically use less water than conventional toilet systems. Furthermore, macerating systems reduce sewage to a liquefied state prior to moving the waste into a secondary septic tank or municipal sewage treatment system, thus reducing the time and work done by anaerobic bacteria. If macerating systems are out of your budget, or simply unsuitable for your particular basement bathroom installation project, a less expensive option is a sump and ejector pump. As a sump pump must sit below that basement floor, you may need to blast through the concrete with a jack hammer. A sewage ejector pump or lift pump is used to pump out the waste as the sump becomes full. 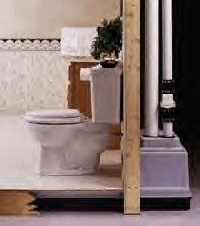 Upflush toilets have also become a popular option for homeowners considering basement bathroom installation. Similar to ejector pumps, upflush toilets require an ejector basin, dug below the floor, prior to toilet installation. Both upflush toilets and ejector pumps require power from an electrical outlet in order to function. Another important consideration for homeowners undertaking a basement bathroom installation is ventilation and lighting. As basements are below ground, they do not often have windows or other ventilation systems. A basement bathroom, if not properly ventilated and illuminated will become a warm, dark, damp breeding ground for mold, mildew and germs. Particularly if you plan to include a shower or tub in your basement bathroom, install a fan or vent to keep the air circulating and prevent the buildup of odors and moisture. A heat lamp can also help to keep a basement bathroom dry, by serving to speed up the evaporation of any moisture. Regardless of whether you select a macerating system, sump pump ejector system or upflush toilet, be sure to carefully test all plumbing connections, pipes and electrical connections before installing flooring, tiling, and other bathroom fixtures.